The morning was spent with Holly and Stan running the New Orleans Marathon while Dave and Pam Race Chased. 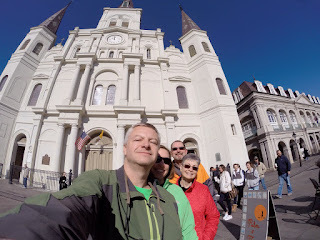 Afterwards, we went back to our Bourbon Street Hotel and prepared for some food and fun in The Quarter. We really didn't do too much walking the rest of the day, but we did hit seven establishments. Our first concern was getting some food. We walked a few doors over to Bayou Burger. The downstairs dining room had a clean, modern sports bar feel. 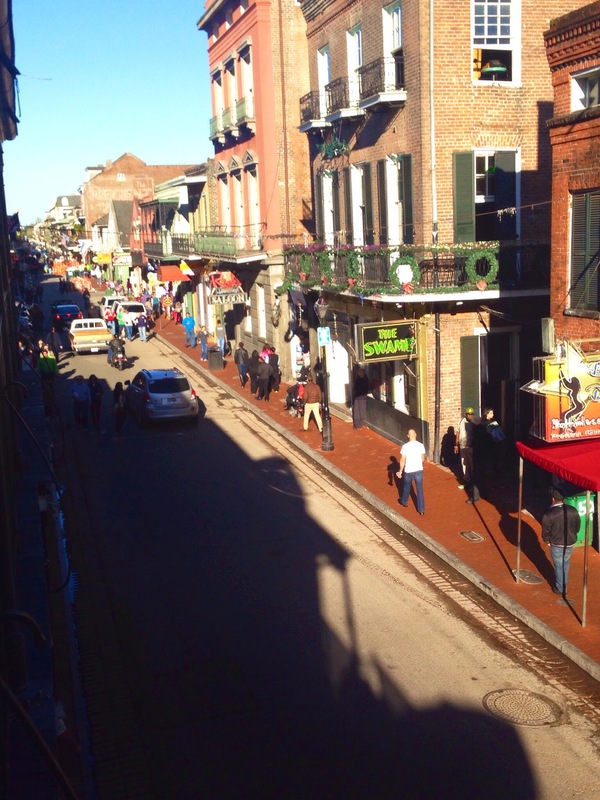 Since the temperature wasn't too bad out we asked to sit outdoors on their Bourbon Street balcony. Lots of fun to have this vantage point of all the fun passing by. Their burgers were great and included some interesting builds. The beer on tap was varied and included many southern options. Our next stop was Beer Fest for some more draft beer sampling. 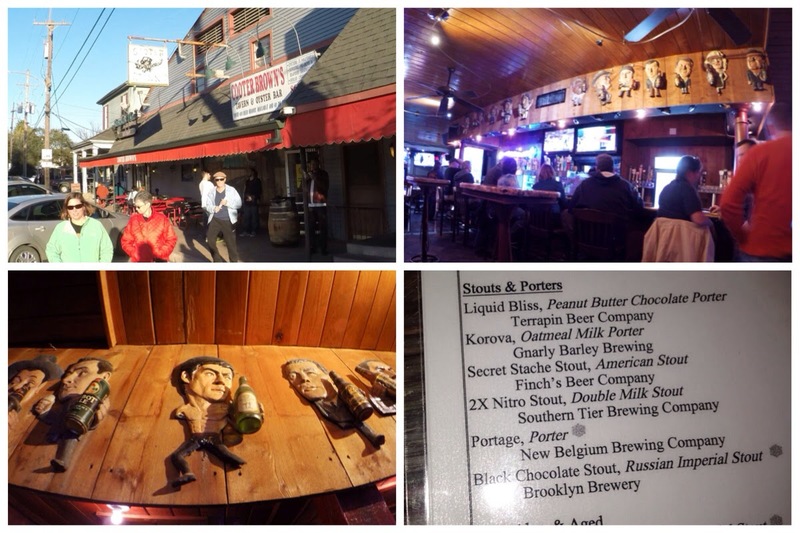 They had quite a bit on tap, but there were a few things about the location we did not enjoy. First, there was someone smoking inside, which we really did not encounter too much, and someone in our party thought they saw a mouse or a rat in the back of house area. Drink up! We were in search of some live music this afternoon and there is plenty to find around Bourbon Street. The sounds of the accordion drew us into Bourbon Heat. 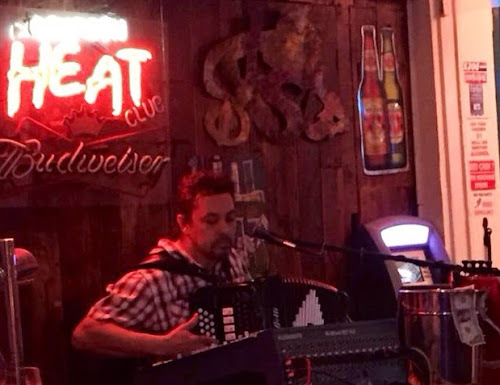 A guy was doing a one-man show with accordion, guitar, and drum-machine. We were lured in by his zydeco songs and accordion skills, but after just a couple of songs he took out the guitar and kicked off that set with "Smooth" by Santana. Check please. Since we sat by the door we really didn't take-in all that Bourbon Heat may have had to offer. 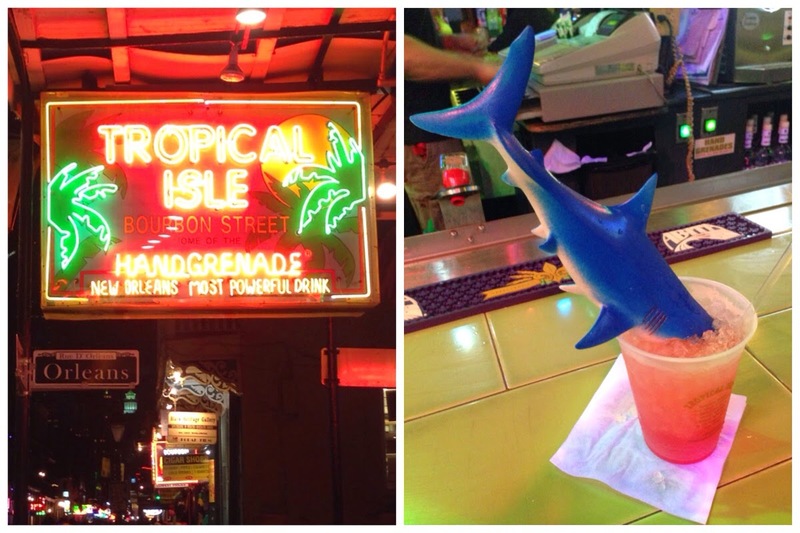 It was time to introduce Stan to one of our New Orleans favorites: a Shark Attack from Tropical Isle. This is a cocktail filled with theatrics. The base drink of vodka and (Sprite maybe) is first mixed up and a small toy animal or person is placed on top. Then the bartender fills grenadine into a plastic shark, plunges it in your drink, all while blowing a whistle and yelling warnings of a shark attack. Fun! Now that we've moved onto liquor, it was time to go to Pat O'Brein's. Instead of hitting the patio again we decided to go to the piano bar. Since it was early we did not have to wait on a line to get in. We were shown to a table up front so we had an excellent view of the dueling piano action. All the performers were great, especially the lady would could do "Scenes from an Italian Restaurant" at 3x speed. Since we had such good seats we decided it was a perfect time to just relax and enjoy the show while having a few hurricanes. After Pat's we wanted to find some jazz. Our Tropical Isle bartender suggested we either go a few doors down to Fritzel's or hoof it passed the French Market to an area just outside The Quarter known for jazz bars. We chose to stay on Bourbon and hit Fritzel's. When we told a local about our choice the next day he looked at us with such disappointment for hitting a tourist place. Guess what? WE ARE TOURISTS! For our purposes it was great. Fritzel's setup was not like a regular bar or restaurant. There were several rows of benches arranged to focus you attention to the small stage in the corner of the room. It felt like we were going to watch a show in Spanky's barn, but with booze. We could not enter the bar until the band went on break. We were once again given the front row. While waiting we decided we were hungry and inquired about food. We were told we could get a pizza cone in the back alley. Dave went out into the dank back alleyway where there was a tiny kitchen that only made these pizza things. Tasty! The jazz band was good and this proved to be a fun stop for us all. 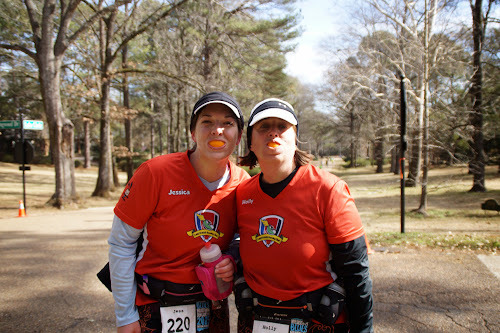 Fatigue from a full day of racing/chasing was starting to set in. Fortunately, we had enough steam for one more stop. 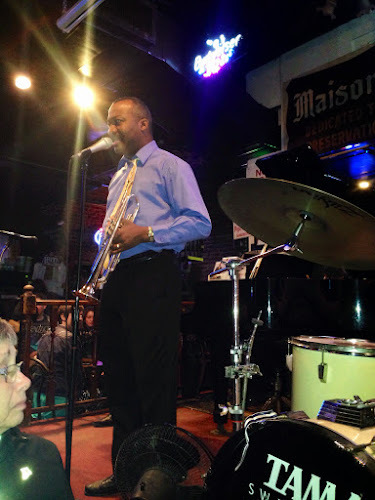 We made the short walk to Maison Bourbon where another jazz band was playing. We were shown to another front table. Within 5 minutes or so the band took a break. After about twenty minutes they came back and played a nice set. As tempting as another set and round would be, none of us had the stamina for it. Off to bed. We still have a full day left in the city as a group, and Dave and Holly had most of Tuesday left to go as well. 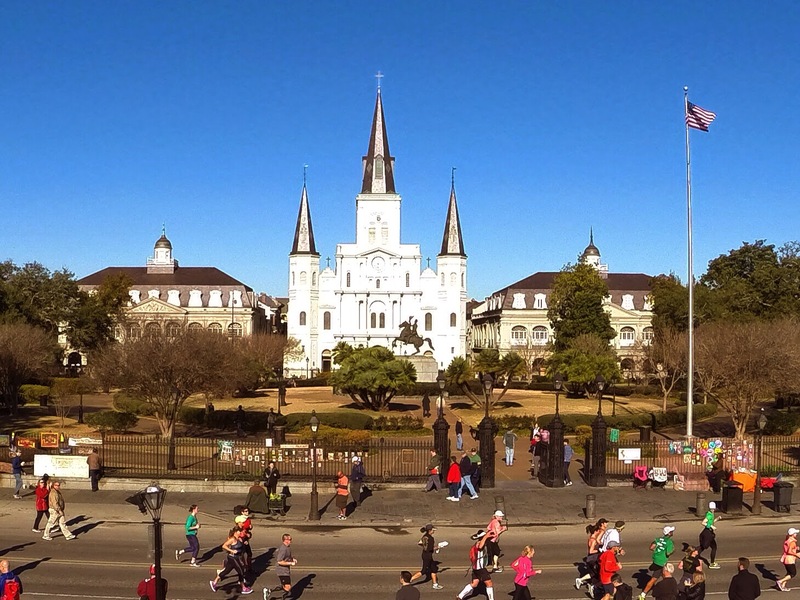 The first thing you want when you wake up in the French Quarter is beer beignets! The four of us decided it would be a great idea to head down to Cafe Du Monde in The French Market. This was at 9:30am on Saturday morning. 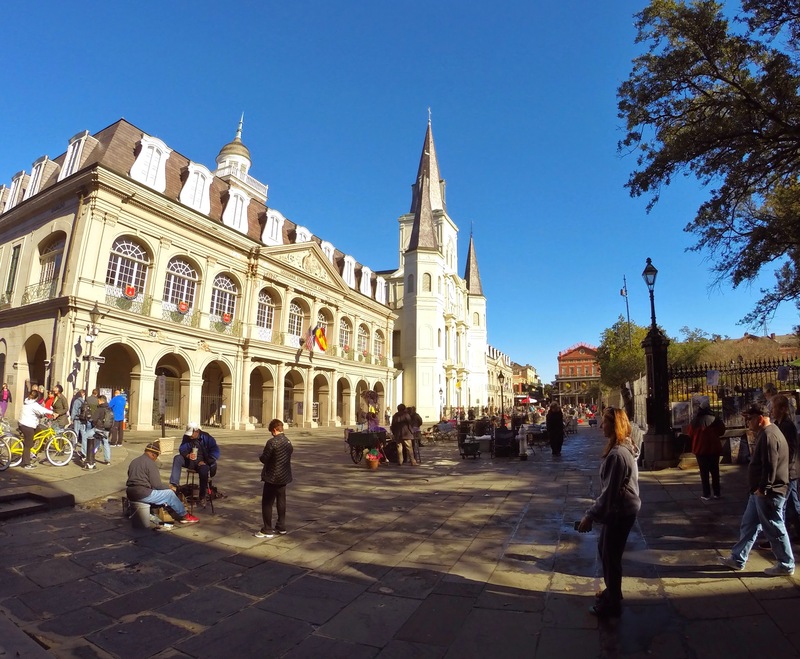 We took our first of approximately 50 trips to Decatur Street and Jackson Square. Silly us for this idea.....the line was huge at both the take-out window and sit-down location. 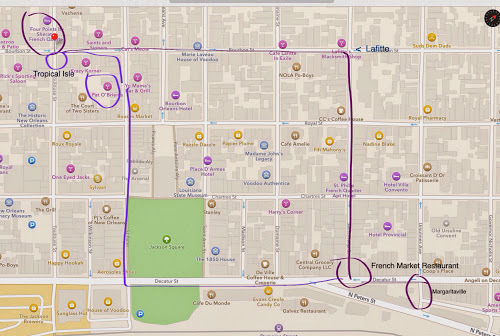 We quickly programmed the closest location of Cafe Beignet into our phones and walked up and over to the Rue Royal location. Found this picture Cafe Beignet online. Now picture that open space filled with people waiting in line to order. 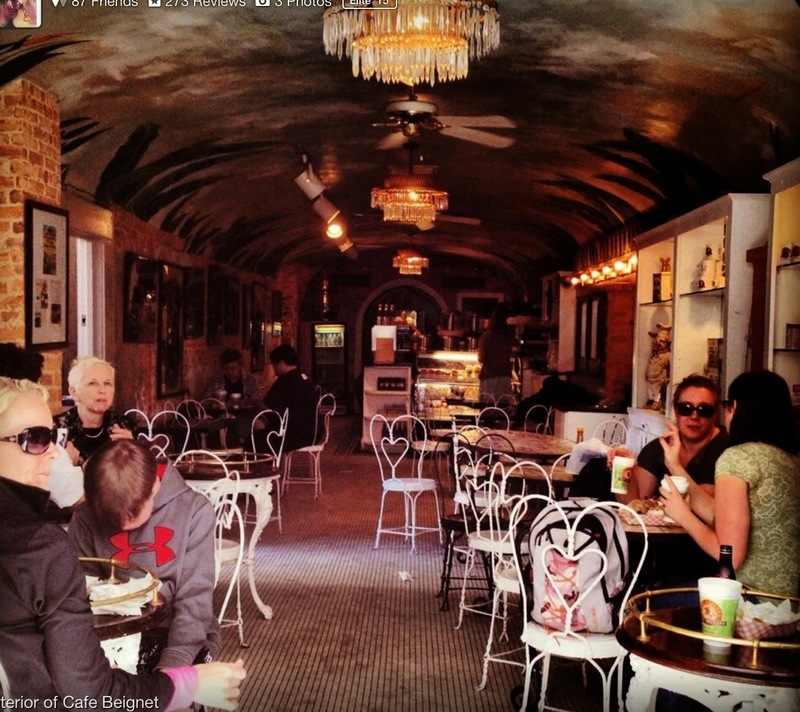 The Cafe was a little larger than a train car cramped with tables and baked good display counter. 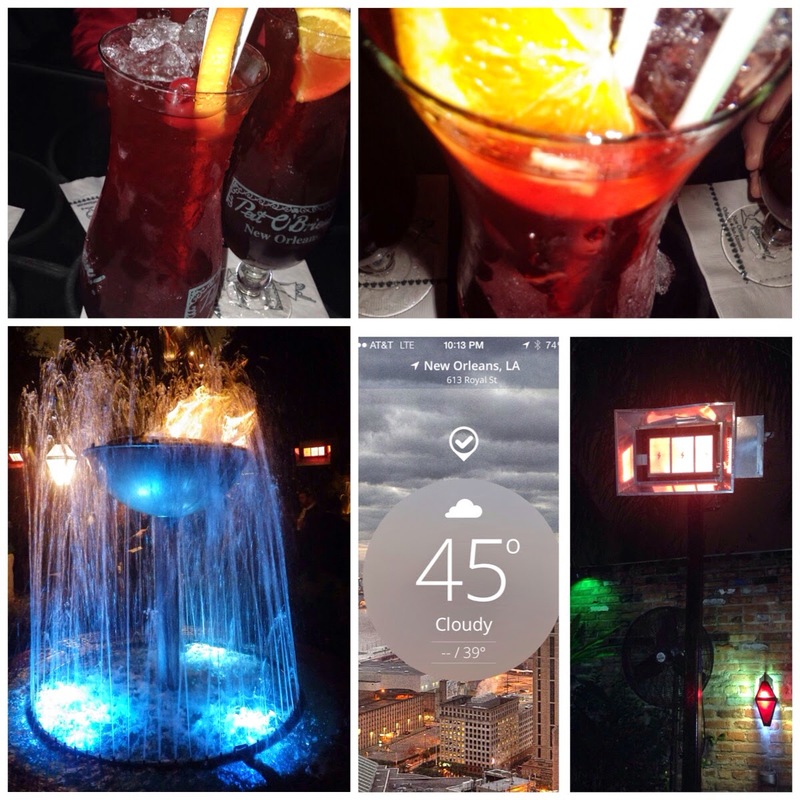 There was outdoor seating, but the temps were still in the low 40's. Dave squatted an outside table while the rest of the crew stayed warm inside and ordered the food. When they came outside, Dave went in to scope out a warmer location. He finally got a table that was the size of a pizza pie tray. Very difficult for four folks to navigate consuming sandwiches, beignets, and drinks. After breakfast we walked back to the hotel so we could drive to the Race Expo at the Convention Center. The drive took us through the business district and it was actually nicer than we pictured. We scored cheap street parking next to the Convention Center, but unfortunately it was on the wrong end of the large complex. This day was supposed to be a light walking day...... It took at least ten minutes to traverse the Convention Center to get to the Expo auditorium. Once we finished at the Expo we hoofed it back to the car and went back to our hotel. Time to find some lunch. We were looking for plain food not too far from the hotel. Thanks to Yelp! we came across Yo Mama's across the street from Pat O'Briens. The place was a two-floor basic bar with some interesting wall hangings here-and-there. Overall pretty dank. The food was good - we had burgers and chicken sandwiches. The bartender was friendly and enjoyed discovering we were all Disney fans. Wanting to keep off-our-feet we decided to take a streetcar ride. 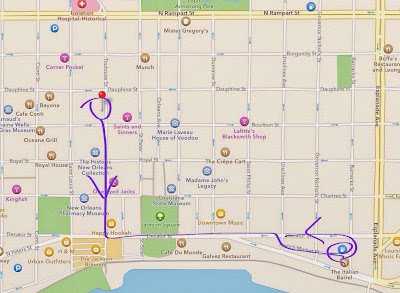 For $1.25 one way you can get a really long tour of the grand houses, parks, colleges, and neighborhoods of the city. Unfortunately we shared the ride with a selfie-crazed bachelorette party. 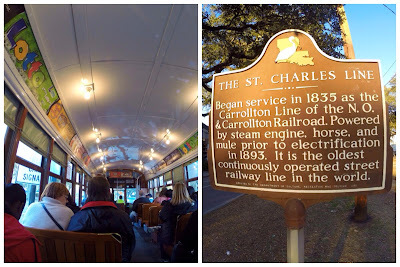 We went pretty far out on the St. Charles Line. 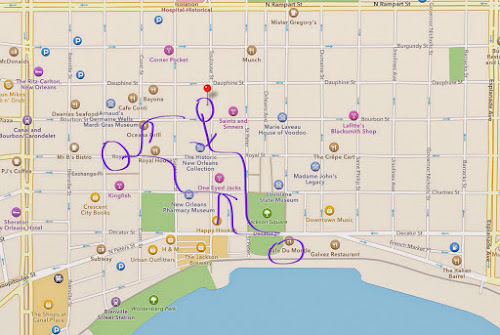 Our plan was to try to find a bar/restaurant for a drink and potty break before turning around. Trying to do this on Yelp! while moving proved difficult. Fortunately some locals overheard us and guided us to our next location (and gave us their all day ride tickets). 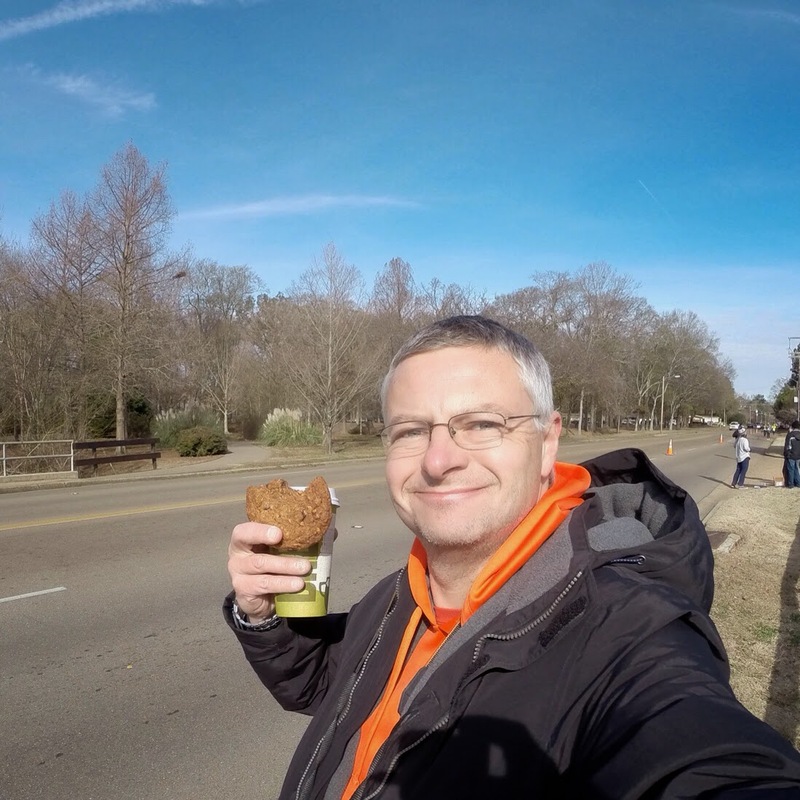 We got off at the turn up Carrollton Ave. and took a short walk to Cooter Brown's. From the outside it was a bit intimidating: no windows, iron gate on the door, a bunch of bikers outside. Inside was a bit better. 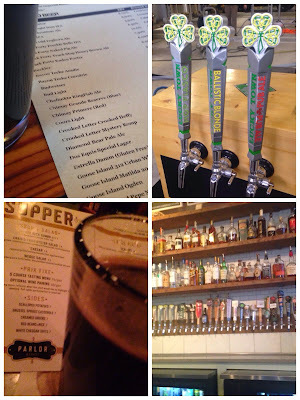 There was a big bar, lots of beer choices on tap and bottles, a busy food window, and a lot of communal tables. 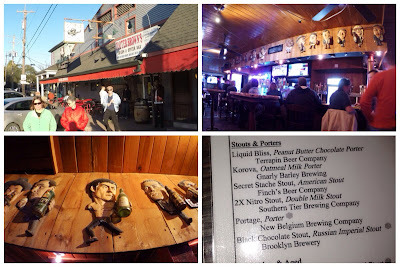 We hung at the back bar called The Snooty Cooter - 34 craft beers on tap and more than 4 were dark beers. On the wall they had great wood carvings of celebrities holding beer bottles. Check out their website for some more examples. This was a great recommendation. 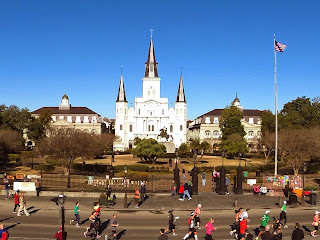 By the time we made the return trip back to The Quarter and walked to our hotel it was almost time for dinner. Since we had to keep our walking light today we booked dinner at a restaurant the farthest we could possibly go and still be in The Quarter: Louisiana Pizza Kitchen. very popular, so it was a good thing we reserved a spot with Open Table. We chose pizza and pasta entrees. Dave went with the Jerk Shrimp pizza. Overall this was a pretty good choice. On our way back we were stopped at the corner of Toulouse and Rue Royal by a wedding parade. 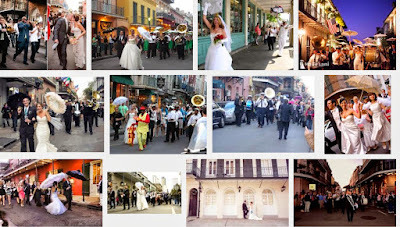 It seems to be a French Quarter thing for an entire wedding to march down the streets of The Quarter waving napkins. 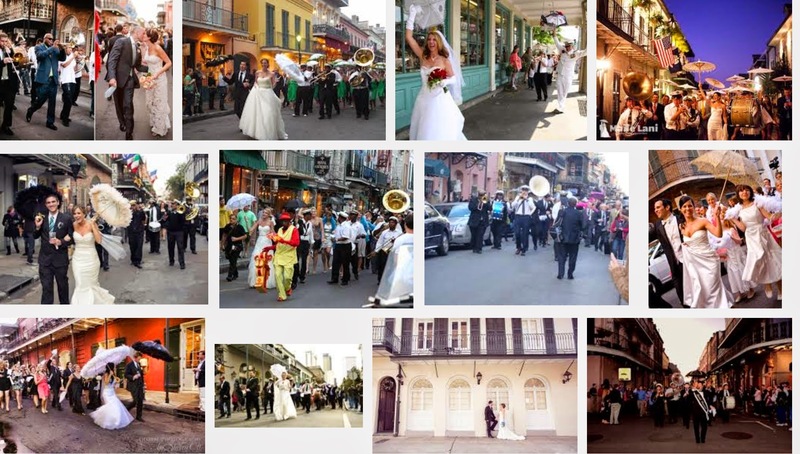 Our pictures didn't turn out too well so here are some samples from Google Images. Unfortunately that was the end of the evening since some of us were here to run a marathon. Don't worry....we made up for it on Sunday. Here's a short and minimally produced video from our Streetcar ride. 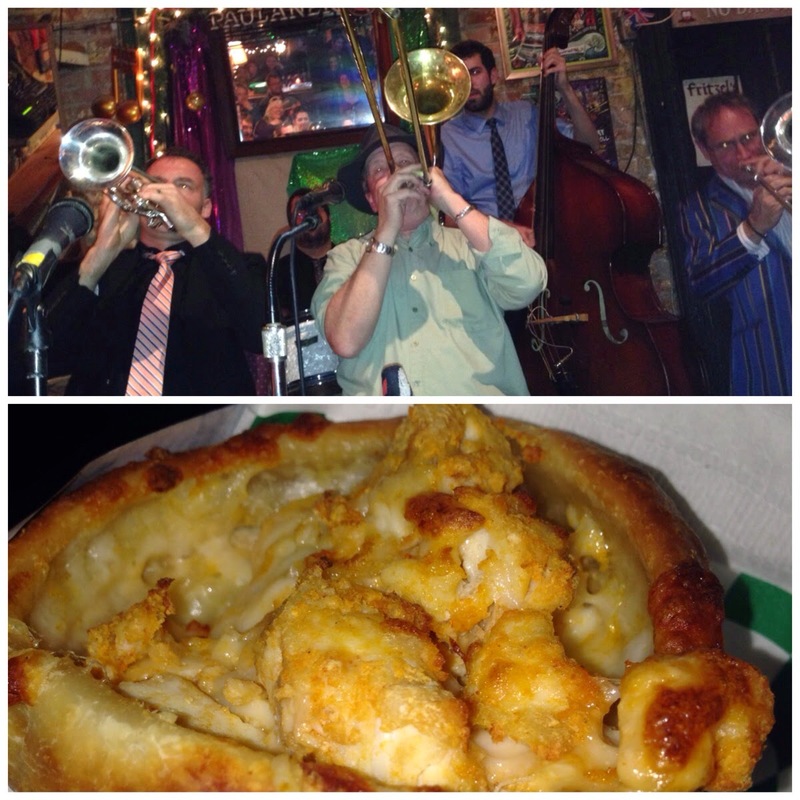 We've recently returned from a few days in New Orleans. 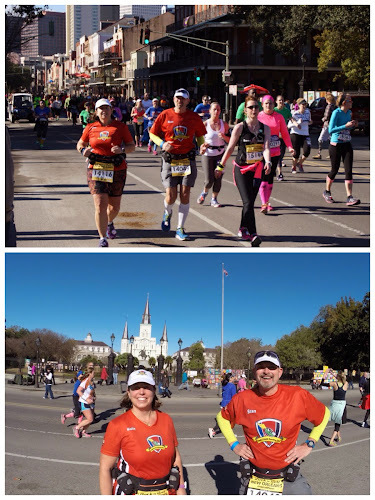 Holly and our friend Stan ran the Rock and Roll New Orleans Marathon while Dave and Pam (Stan's wife) went on another Race Chase adventure. 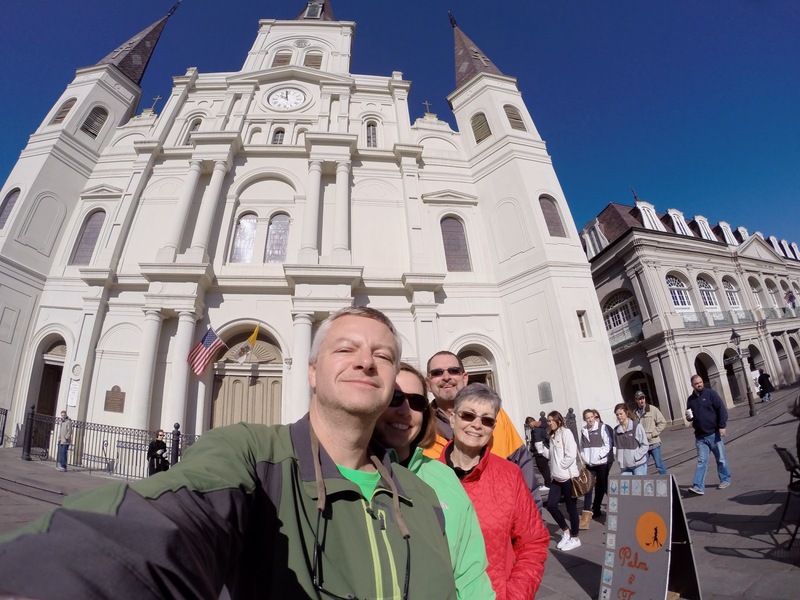 We spent most of our time in New Orleans touring the French Quarter. Accommodations: We stayed at the Four Points Sheraton French Quarter, which was on the corner of Bourbon and Toulouse (aka Party Central). Upon arrival we realized we were the oldest guests by decades and likely the only guests with less than 7 people sharing a room. 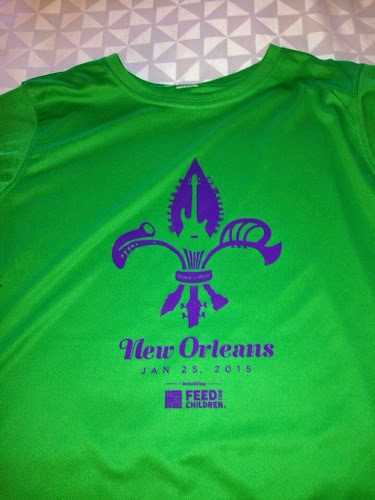 We imagined revelers would be disturbing our sleep before marathon morning. Surprisingly the rooms were very quiet (we booked courtyard view vs. street view rooms). Fun fact: The hotel was the first opera house ever in America, built in 1859. The Four Points had a restaurant and a bar with cheap drink prices. The location worked out very well for us and we'd stay there again. We were all checked-in by 6:30 and ventured out onto Bourbon Street. 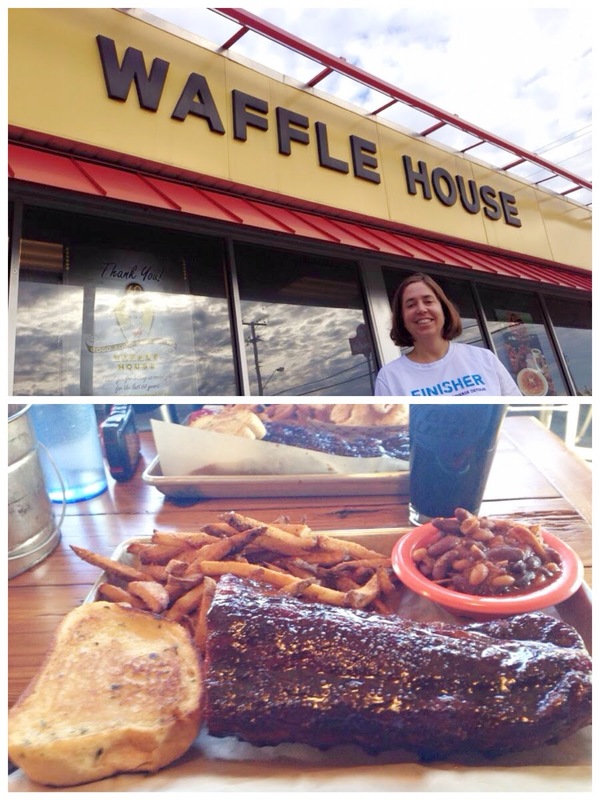 We decided we needed food sooner-than-later and browsed menus along the way. Not finding anything of interest we ducked into the courtyard bar of Lafitte's Blacksmith Shop to formulate a plan. The bartender suggested that if we were looking for cajun food we should go to Coop's Place. 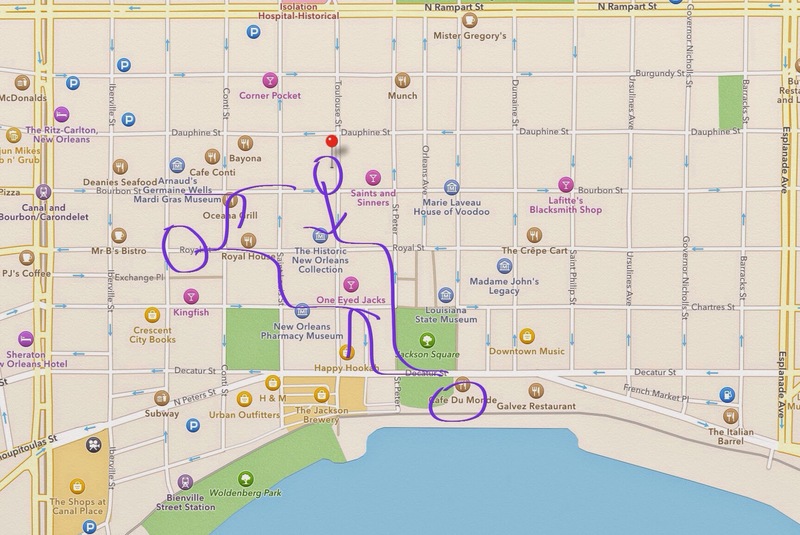 We checked the menu on our phone and decided we should make the several block trip. We poured our beers in to-go cups (a NOLA perk we didn't take advantage of enough) and headed to Decatur. Coop's had a line out the door. Being impatient folks, we opted to backtrack a block or so to The French Market Restaurant. 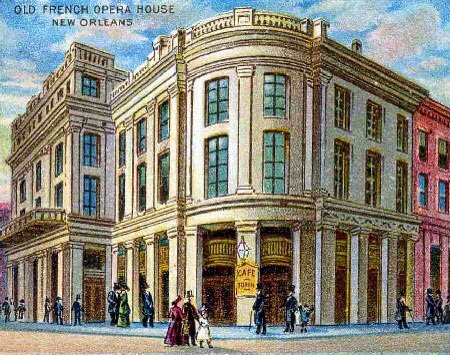 The location has been an eating establishment since way before the Jackson Administration and specialized in oysters and seafood boils. 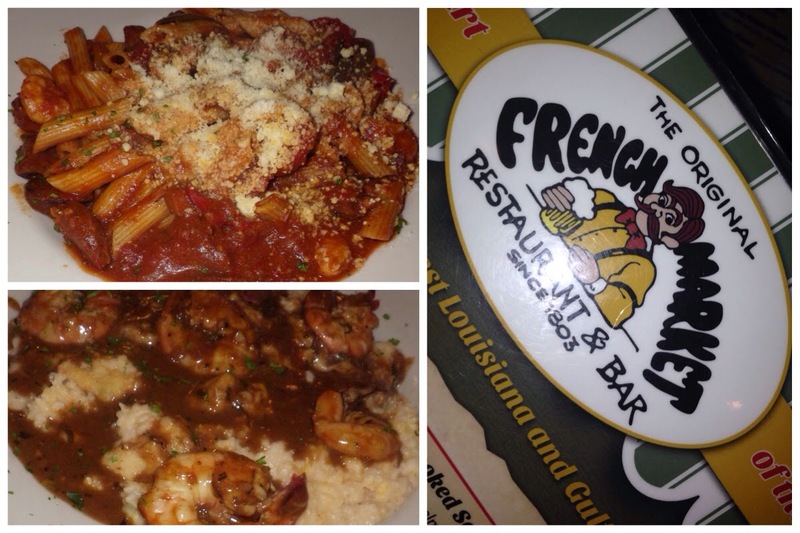 We had some excellent food including shrimp and grits, gumbo, and pasta jambalaya. Dave had his first new beer of the trip: Andy Gator from Abita. We decided to pop into Margaritaville since we were so close. 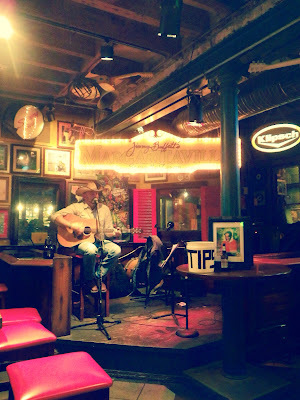 We walked into the bar section that had a country guitarist playing to one patron. Bicycle Jones was playing a heavy set of Garth Brooks (thanks Stan for cluing us in) that was actually very pleasant. 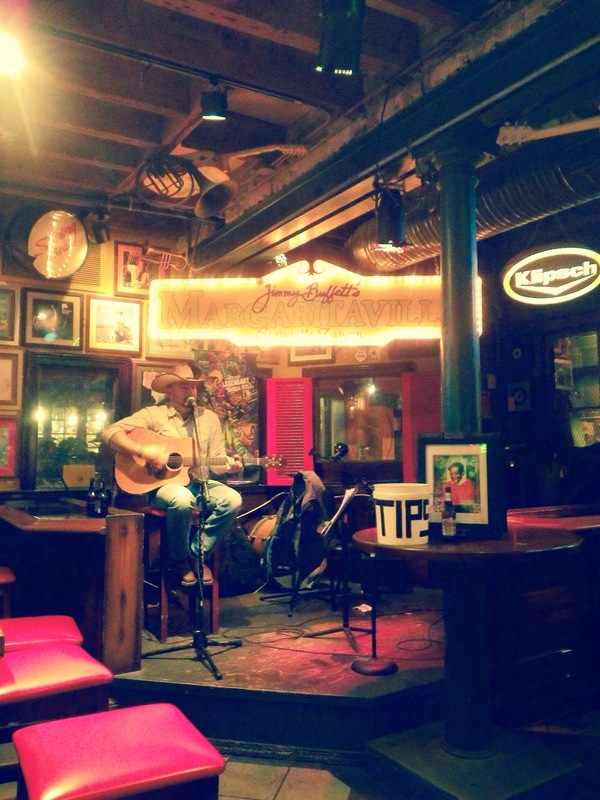 We enjoyed his voice and his between-song banter. Drinks were cheap for nighttime happy hour so we stayed for two rounds and enjoyed the quality entertainment. 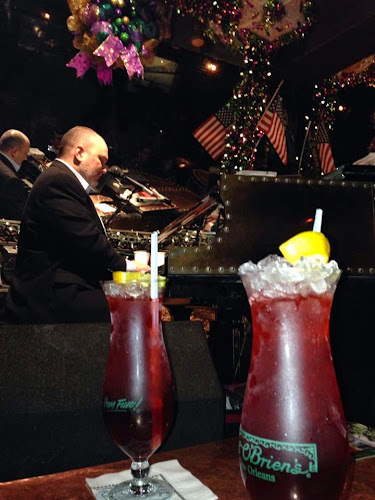 We could not let the night end without a visit to Pat O'Briens. It's the famous bar that serves many hurricanes. The line for the piano bar was out the door (and out the door to the street) so we opted for the chilly patio. We switched tables a few times during the evening to try to keep warm via heat lamps. We all got Hurricanes and spent the rest of the evening talking, catching up, and trying to keep warm. Just a comment on the temperature: All four of us live in Illinois. If we were at home the 45 degrees would not be a big deal. However, low temperatures in the south always chill us. We hypothesize it's the moister air. 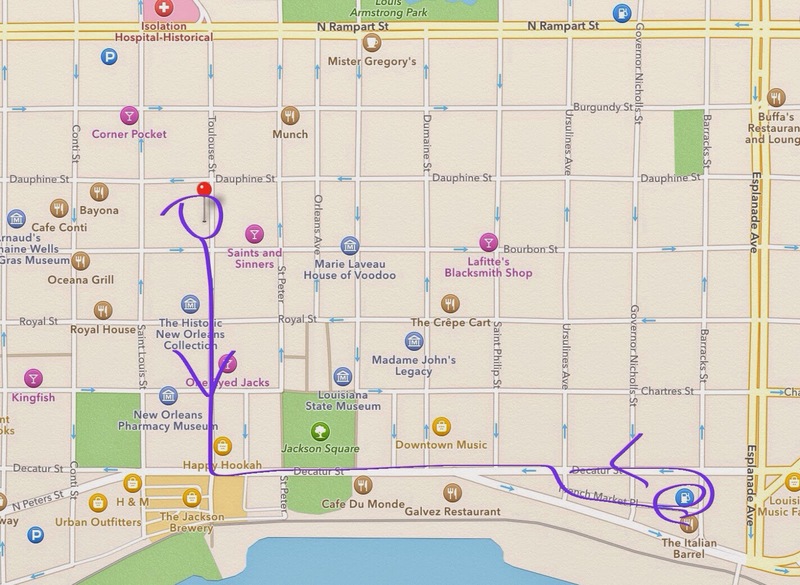 We left Pat O'Brien's late (for us) and took the short walk back to the hotel. December and January: For the last two months we sponsored Heifer International to help others get supplies they need to start their own small farm business. We will be donating $250 plus a matching gift to Heifer by picking out some animals through their online catalog. You can still donate by following this link. BlazeSports America formed in Atlanta after the 1996 Olympics and Paralympics held in that city. 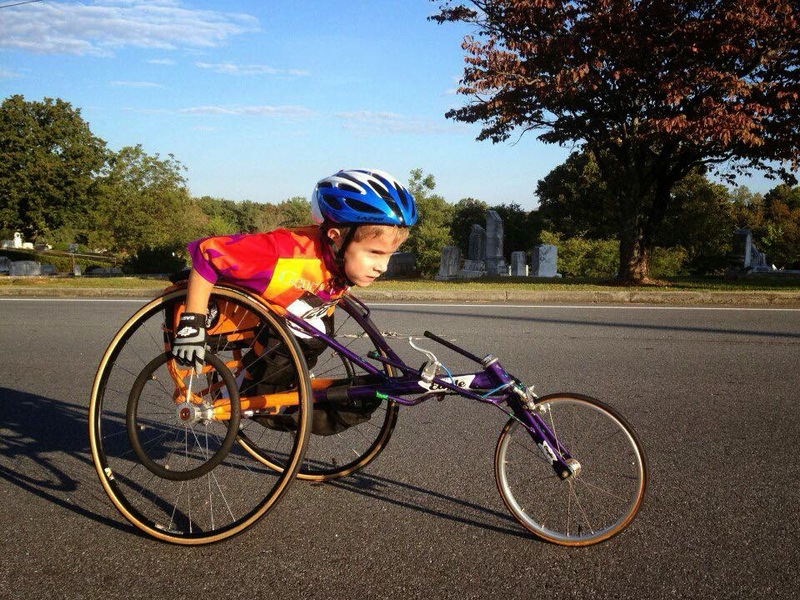 In a sentence or two: BlazeSports prepares disabled youth and veterans for an independent and successful life through Paralympic and other adaptive sports. BlazeSports lends its help to make community-based adaptive sports programs a reality for many. 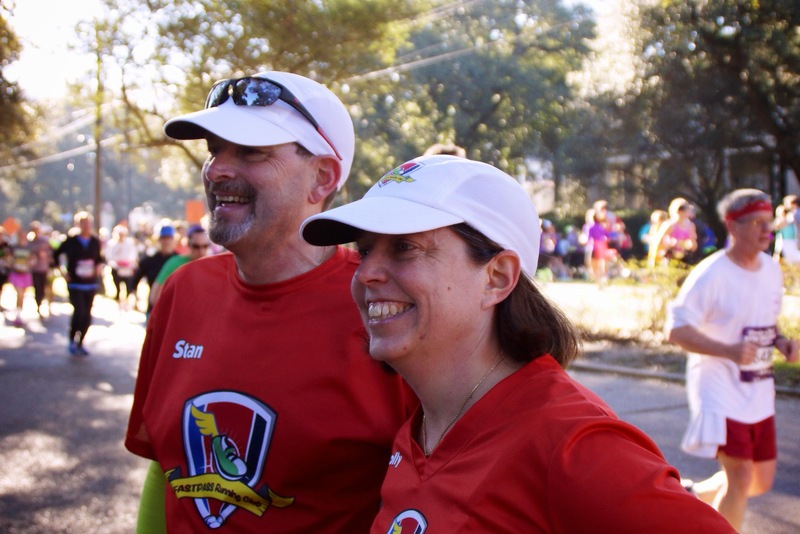 This organization made our radar because of our friend, and Team AllEars teammate, Alex. He has two boys in BlazeSports programs. For the last two years we've seen photos of his boys winning basketball tournaments, skiing, playing baseball. We've met all three of Alex's sons and they are some of the most genuine, confident, and outgoing individuals we have come across in a long time. Recently Alex had this to say on Facebook: "For the record: 2 of my 3 boys have spina bifida. Yet they're high academic performers in gifted/AP classes, they're both athletes who love to compete in many sports, and they have sky-high self confidence that makes them believe they can do anything! This is due in part to our years of involvement with BlazeSports America and the many people, both on the court and in the office, who pour themselves into my boys and others. My wife and I are fond of those who care for our boys. For all those who have invested in our boys in the past, and presently, I am indebted to you, and am committed to you. THANK YOU!" Team wins at the NWBA North Carolina Winter Classic regional tournament during November of 2014. Samuel (left) plays on the Atlanta Jr. 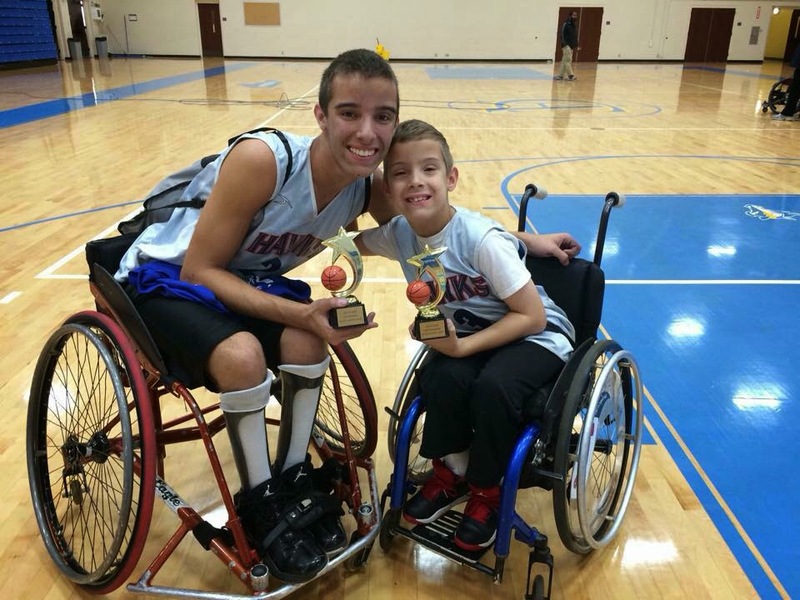 Wheelchair Hawks - Varsity team. Zachary (right) plays on the Prep team. Both teams won their divisions. 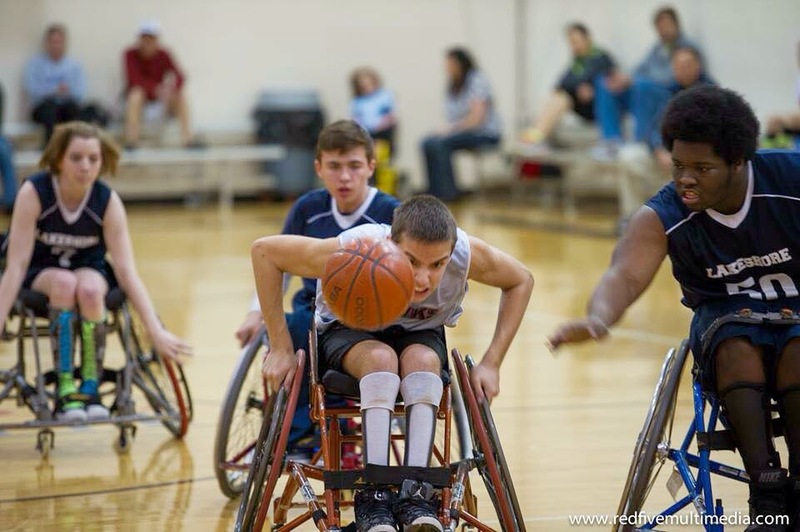 You can help BlazeSports America bring the dream of competitive sports to others by using the button below to go to their online donation page. 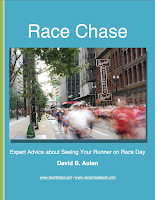 This race has been on my radar for a while. The problem was the date. 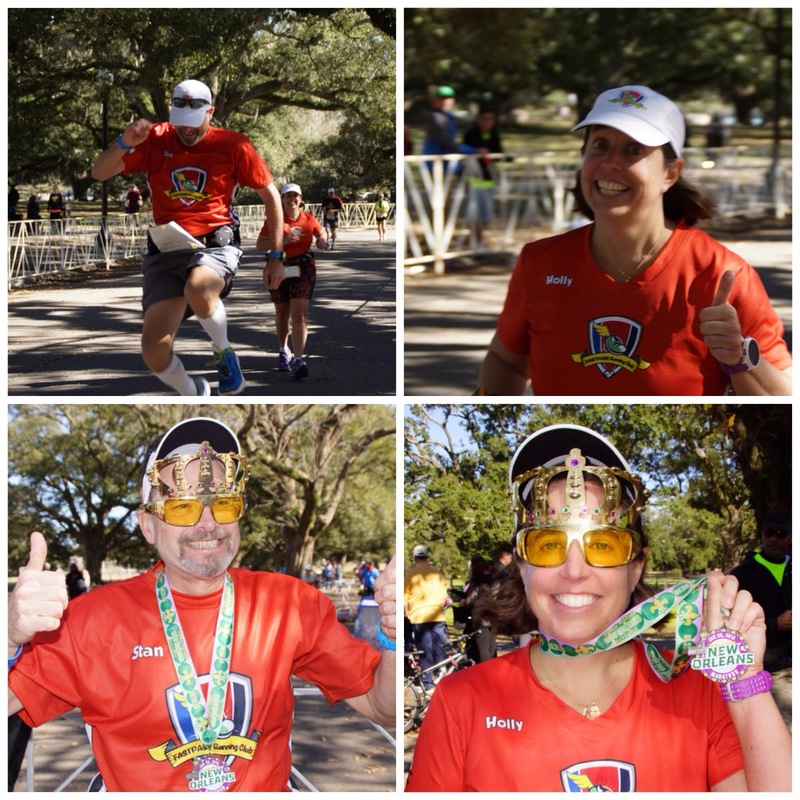 It is always the same weekend as Disney Marathon Weekend. 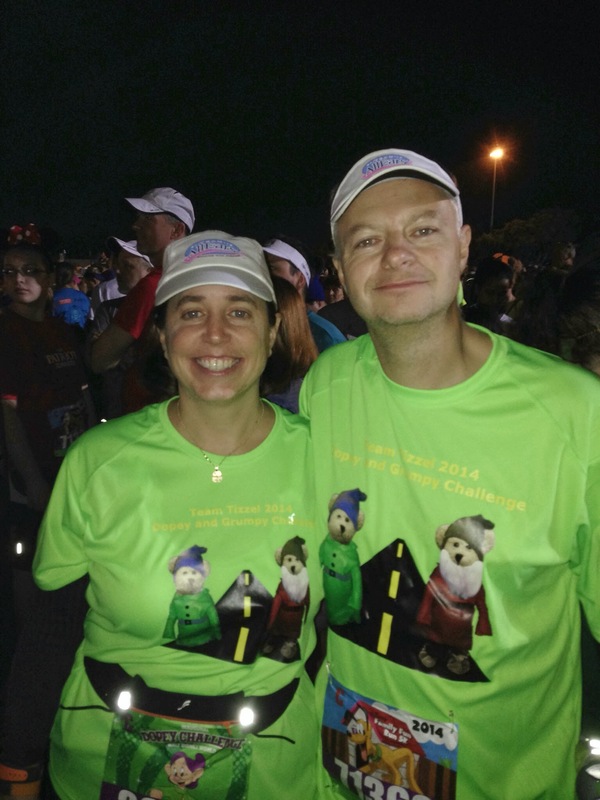 I have participated in WDW Marathon Weekend races for last 5 years. After 5 years of early wake ups and the same race experience I was ready to take a break from Disney. I was able to talk my good friend Jessica into skipping Disney as well and we registered for Mississippi. We got into Jackson Friday afternoon and met up with Jessica and her adorable daughter Harper we had a great lunch at The Iron Horse Grill then hit the small expo. It didn’t take long to get our bibs and really nice running vest included in the registration. We met up again later for a great Italian dinner at Bravo! where we got to meet Jessica’s Dad again. 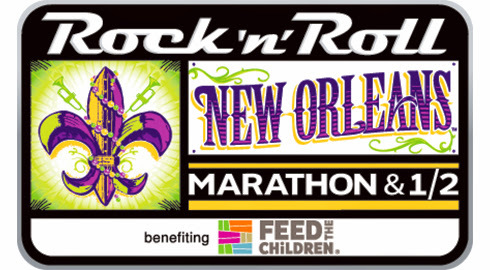 Back to the hotel and in bed early to get ready for the race the next day. 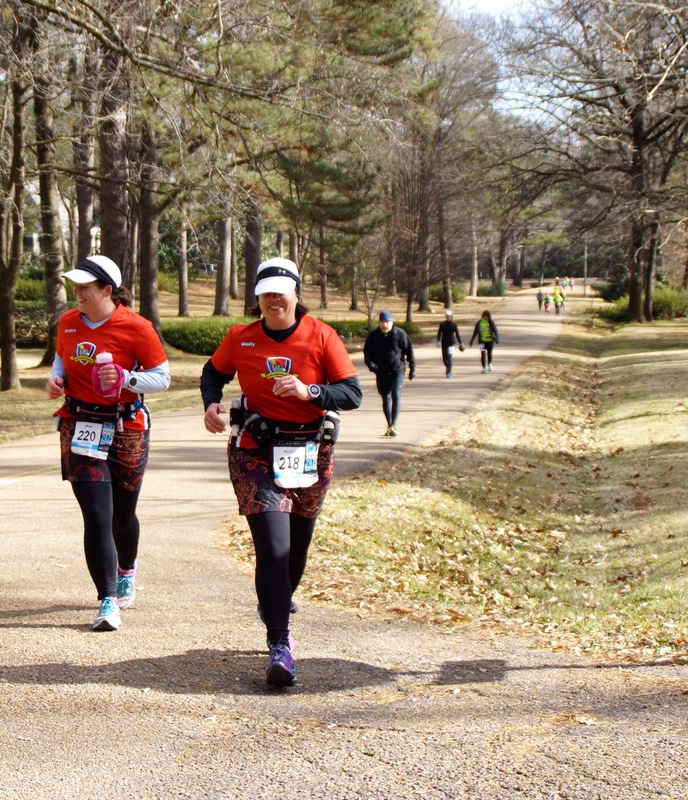 When I planned Mississippi in January I figured it would be great weather, not too hot and certainly not cold. Wrong! It was freezing. It was in the 20’s with a real feel in the teens. I blame Jessica because she hates the heat. 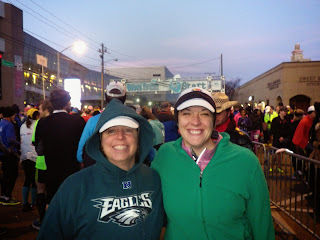 Dave and I walked to the start and I was already freezing. Jessica drove over from her hotel and had some trouble parking but made it to the start with 15 minutes to spare. This was a pretty small race with a half as well as a full. Jessica and I were both nervous for the hills that everyone talked about. Jessica being from hilly Atlanta didn’t think they were that bad. Me being from flat Illinois thought they were challenging. It definitely rolled for the entire course. It was really great running with Jessica. 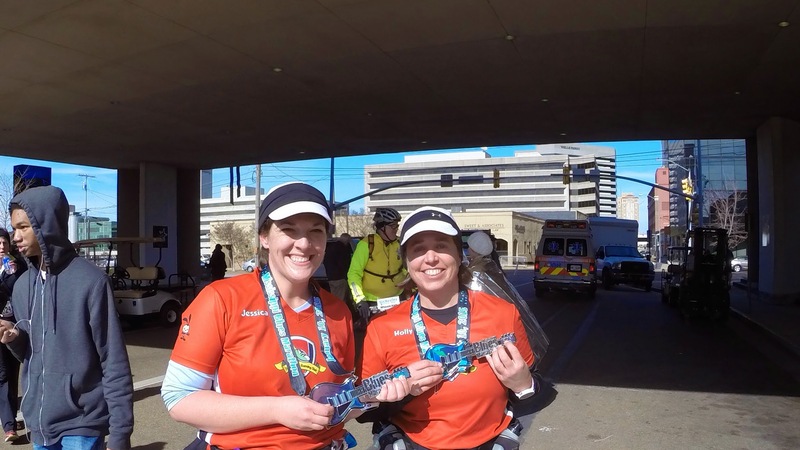 We haven’t seen each other for almost a year and we really just chatted for 26.2 miles. The miles went quickly for once and we were both amazed at how good we felt. Perhaps it was the cold weather or perhaps it was the company but this was the best I have felt during an entire marathon in a very long time. 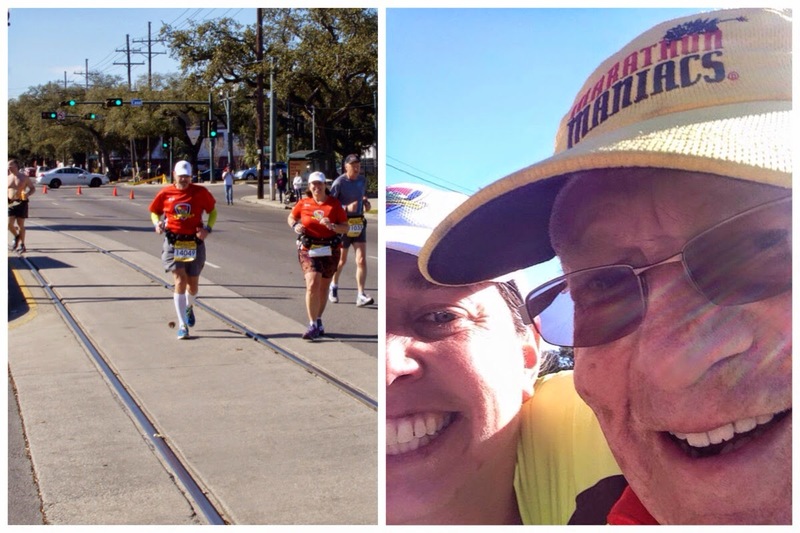 Dave did a fantastic job of following us around the course and he found us a million times! At one point he even said he was going to take a break because we were getting sick of each other. Many thanks for taking our sweaty layers as we shed them and for giving us snacks! Jessica’s Dad came out with sweet Harper and that was a fun surprise as well. The finish was great and the medal even better. A huge guitar medal with a pick! 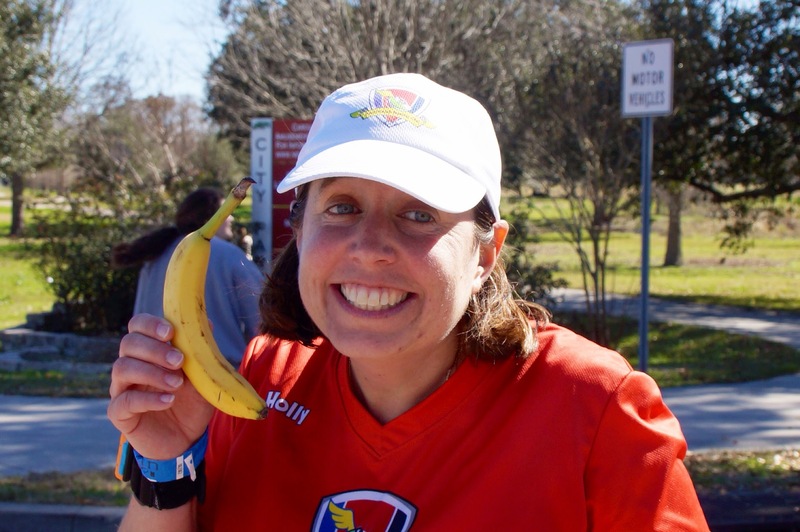 Post race beer and pizza for even the latecomers. This is a first class event that I would go back and do again. 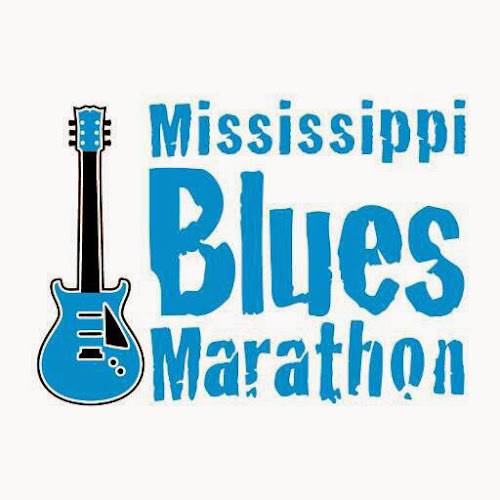 If you need to check off Mississippi this is the one to do! It really could not have been an easier course to navigate. Other than the first four miles there weren't any road closures. The ones that were closed, the police still let you drive on them. 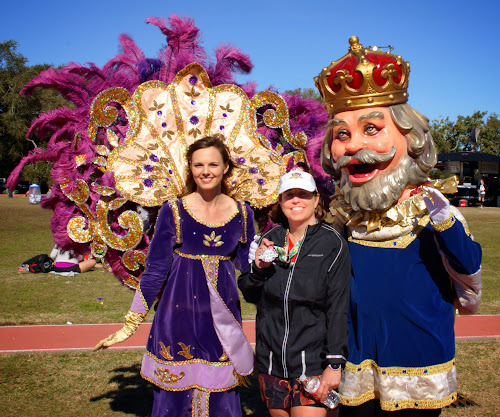 There were friendly volunteers everywhere directing traffic and letting cars cross the course. I did not appreciate the cold weather, but it eventually warmed up a bit and I could shed the parka. 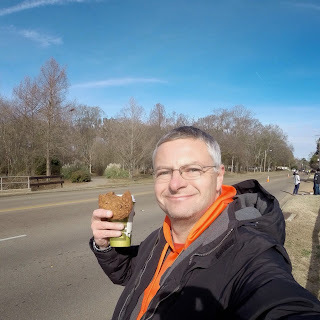 My spectating locations included the start line, mile 3, 5, a drive-by, twice along mile 7, another drive-by, mile 8, (this is when I said I will move ahead a bit), mile 11, 12 (that was supposed to be 13 but the map was mislabeled), 16, twice at 18, 20, 22, a drive-by, 23, 24, and the finish. Snacks included cookies I bought at Whole Foods, an apple, and coffee from several stops along the way. The course went though mostly nice sections of town, with some VERY nice homes. Quite the contrast to downtown Jackson. 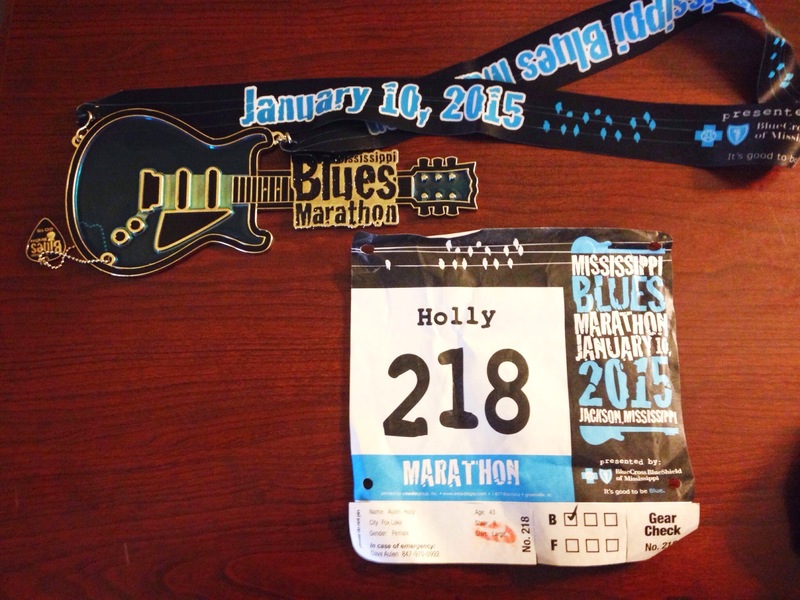 When Holly registered for the race Jackson did not have a single brewery. Luckily, one opened up in November and we had a chance to visit Lucky Town. This was a very homegrown brewery in an overlooked section of town. Folks were friendly and the beer was great. Other places like Iron Horse, Pig & Pint, Saltine, and Parlor Market demonstrated that Mississippi actually does appreciate craft beer - especially those brewed in the south. Food: Iron Horse was excellent at lunch. Everything was char grilled and that took beef tenderloin fajitas up a notch. At Pig & Pint we had killer ribs - my first real southern BBQ experience. 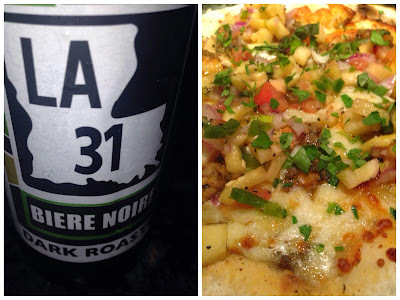 We had great appetizers at Parlor Market - one of the only nice places right in downtown. Of course, what trip to the south is complete without Waffle House. Sorry for the first minute of poor audio. The pocket camera records the audio and video but for some reason no longer downloads the audio. Sound plays through the camera speaker so I put our awful Skye microphone by it and tried my best.